Bandai has come up with a piggy bank that resembles an extremely cute dog made up of many rotund segments, helping teach your little one the virtues of saving up for a rainy day. 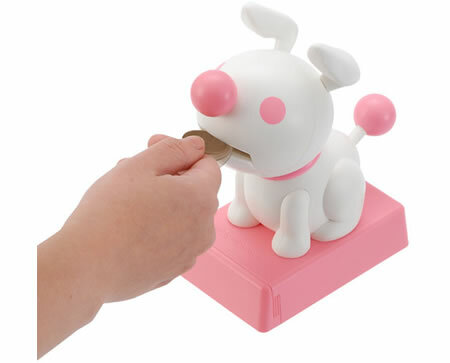 This coin bank’s extremely large nose is there for a very good reason – it houses a motion detector within that will activate mouth movement to open up whenever your hand goes near it to deliver not doggy treats, but coins where he will gladly eat it up and swallow. All coins will be accumulated at the tray below where it can later be removed once puppy needs to perform a ‘potty time’. Out in Japan fron November onwards, we’re not sure just how much it will cost.